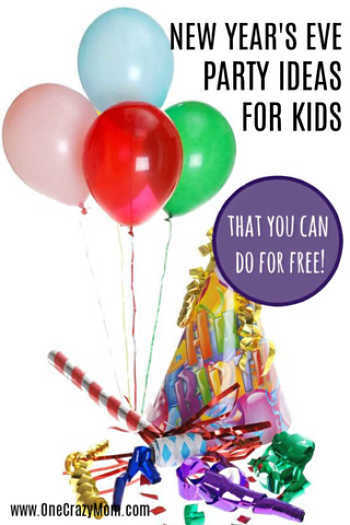 8 New Years Eve Party Ideas for kids – Without Spending a Dime! 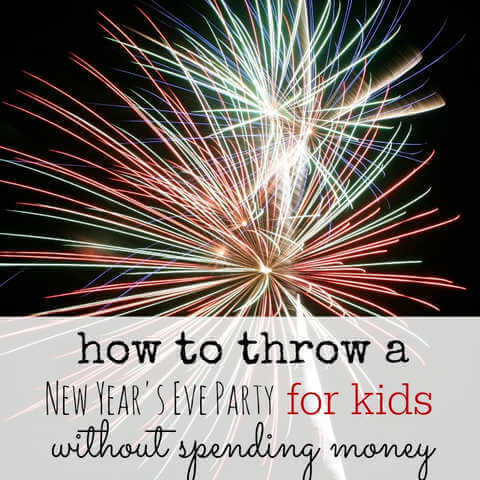 We have New Years Eve party ideas for kids that are budget friendly and sure to be a blast! Try these 8 family friendly New Years Eve ideas everyone will enjoy. I love celebrating New Years with my kids. Don’t you? I thought I would share some quick New years Eve party ideas without spending a dime! In fact, invite family and friends over to celebrate with you. I promise… you don’t have to spend a penny to celebrate. There is no need to spend tons of time and money throwing a lavish party. Kid’s don’t need all of that and just want to have fun. We have 8 fun new years ideas for kids that will inspire you to celebrate! Let’s get started! You are going to love these fun and budget friendly ideas for the best party yet! 1. Do the Countdown early with New Year’s Eve countdown activities. Unless you have teenagers, kids just can’t handle staying up till midnight for the ball drop. Extend their bedtime by an hour or two and make that the New Years mark. Kids don’t care. They just want the countdown and the celebration and fun stuff like noise makers. Make it a big deal like it really is midnight and they really won’t care with a fun idea such as countdown clocks or a balloon countdown. Never underestimate the power of balloons. Kids of all ages love playing with balloons and they are so cheap! 2. Make it a Pajama party. Instead of dressing in your New Years best, wear your PJs. The kids will love this idea and even the adults will have a lot more fun being comfortable in their pajamas. I know I’m most comfy in my sweatpants and would love to ring in the new year this way. 🙂 This one sounds like a winner for sure! 3. Skip Dinner and serve finger foods. What kid wouldn’t be so happy to find out that they are having chicken nuggets, chips, carrot sticks, brownie bites (we love these Mini Brownie Bites), and other kid friendly finger foods for dinner. You don’t have to stress and the kids will thank you! This one will be a hit with the kids for sure! If you are inviting friends and family over. Have them bring a finger food too. Don’t tell them what to bring…. just have them bring what they can make with what is in their fridge. You are not spending any money if you are making from what you already have. 5. Play classic family games. You don’t have to spend a dime on fun activities to do with your kids. Turn off the TV. Play hide-n-seek, charades, musical chairs, hot potato, tic tac toe, and hopscotch. You might think those are juvenile games, but when the adults get involved everyone has fun. My kids especially love playing hot potato. We play it at almost every gathering and it keeps the kids entertained. 6. Make your own party hats. Grab the stuff you have laying around and you can make your own party hats for New Year’s Eve.. It isn’t difficult and everyone will love it. If you want to spend a little money, you can buy plain party hats at dollar tree and then decorate those. Make sure you take a picture to remember next year. 7. Decorate with what you have. Decorations make the party.. don’t you think? However, don’t spend money. Have the kids Cut out letters saying “2019” or “Happy New Years”. Add some twine or string and you just made a banner. Got those balloons left over from the birthday party? No problem! Blow them up and toss them around. Kids love a room filled with balloons. You can even decorate a paper plate with markers. Think outside the box! You can spend money on a sparkling beverage for the kids, but you can make your own. All you need is Sprite and some juice. My kids love orange juice or grape juice mixed with Sprite. They will love it and you probably have those in your pantry already. You will also love this 2 ingredient Cotton Candy Drink recipe and this Party punch recipe. Money doesn’t make a party – the family does! Take some of these family friendly New Years Eve Party ideas to make sure your kids have a blast this year. No need to spend a ton of money or time. Just use what you have and gather the family around. It’s about memories and experiences, not spending tons of money with lavish parties. I’m sure that whatever you plan will be a blast. Let’s start this new year being intentional about making memories. Give these kid friendly New Years eve parties a try! You don’t have to spend money or go anywhere fancy to have a great time. It can be hard to find places to go for New Years Eve with family. Try some of these New Year’s Eve party ideas for kids that will make for a fun night. Another idea is to get the kids to make their New Year’s resolutions. I spotted a free printable here that kids can write their New Year’s resolutions on. So fun and it is free! Don’t spend tons of money on New Years Eve family packages when you can try these frugal party ideas at home. Just try some of these fun ideas at home and I bet everyone will have a blast. Please share any tips or fun ideas. We are always looking for new ideas and family activities that are easy on the budget. If you are throwing a party, we have a ton of Graduation Party Food Ideas that are easy to prepare, budget friendly and incredibly tasty. Frugal Birthday Party Decorations to go with any theme.